the catnip oil remedy, what sort of side effects can you expect? It’s important that while most uses of catnip are normally safe, smoking the herb is not recommended and has been deemed potentially unsafe. A sleepy and sedative like effect are the catnip and catnip tea benefits that you can normally expect. This is why the plant is so popular as both and individual agent and a component in combination natural sleep remedies. And, it’s use in cuisine can give you a clue as to how mild it is when used occasionally and in proper quantities. However, there are some catnip tea side effects that you should know about before using, particularly if you are in certain, tender stages of life or are very sensitive to adverse effects of medicine. Are you close to having a surgery? Well, put down the mug because there are many who suggest that catnip tea side effects include a slowing of the central nervous system. This can adversely affect anesthesia and medications, so while you may be stressed about an upcoming tonsillectomy, you’ll have to quell your mental chaos via other methods. Ladies, you have to be especially aware of catnip tea side effects. Those with PID can experience the onset of menstruation, and expecting mothers should never use this kitty calmer for its associated risk of miscarriage due to uterus stimulation. Breast feeding mommies should also pass on the grass because while there are no catnip tea side effects directly linked to lactating ladies, the best rule of thumb is to err on the side of caution and unwind in another way. General catnip tea side effects relevant to both genders exist as well, although they are typically mild or even nonexistent. For instance, some users experience a headache, which is unusual because this perennial is actually touted as a migraine remedy. Others report a general ill feeling amongst catnip tea side effects. Vomiting and gastrointestinal discomfort have also been mentioned. 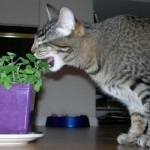 Adverse catnip tea side effects are, however, relatively uncommon and almost always mild. Catnip can be a great natural vehicle for relaxation and serenity, but, in a compromised or tender body, can be potentially hazardous. It’s best to discuss all herbal remedies you plan to employ with your health care provider before doing so. He or she can talk to you not only about catnip tea side effects, for instance, but also about interactions between this and other plants with your current medications or health conditions to make sure that they are safe for you to use as a natural alternative to manufactured medicines.